A trio of human geographers reflect on their fieldwork with ethnic minority Hmong and Yao in northern Vietnam this past summer. 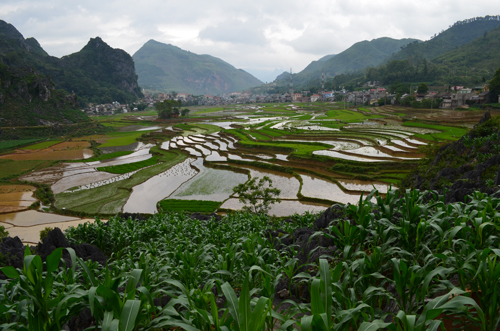 Upland maize fields and rice paddies tended by ethnic minority farmers in northern Vietnam. / Photo: Victoria Kyeyune. Victoria: It’s April 29. My flight is ascending into the bright afternoon sky, enveloped in space. In hours I accumulate time zones and jet lag. Touchdown! After a few days acclimating to 39°C heat and ‘Hanoisy Hanoi’ (as the locals call it), I’m now officially a human geographer in Vietnam. Now what? Down to business: investigating the merits and challenges of high-yielding hybrid maize seed varieties introduced by the state for ethnic minority Hmong households in Hà Giang province. The first step is to meet with my host institution at Vietnam National University in Hanoi to finalize my workplan and research access to Hà Giang, which is situated in the politically sensitive frontier region bordering China. Upon reaching the uplands of Hà Giang, I collaborate with my remarkable Hmong research assistant and interpreter, Mika, who has taught herself English from being a tourist trekking guide. We use various qualitative interview methods to examine the impacts of hybrid maize seeds on existing Hmong farming practices, livelihoods and household food security. After customary cups of tea, armed with our official red stamps of approval, a Blackberry full of interview questions, my sidekick DSLR camera, and a pocket digital audio recorder, Mika and I set out on motorbike taxis (xe om) each day to find potential research participants. From semi-structured interviews with agricultural extension officers, to conversational interviews with Hmong householders, to participant observation in bustling marketplaces, we examine the role of maize as a staple crop within Hmong subsistence livelihoods in five rural communes. We quickly learn that some hybrid maize seeds do offer higher yields, but only if grown with suitable fertilizer and pesticide inputs on flat land. Such land is scarce in the rocky plateaus where we are working, which are far better suited for growing local maize varieties. As my thesis supervisor Dr. Sarah Turner has found during previous research in neighboring Lào Cai province, buffalo and pig are also key financial capital for Hmong households. What I find most surprising in my fieldwork, however, is that while state policies for hybrid seeds aim to improve maize yields for human consumption, many Hmong households use hybrid maize instead to feed their precious livestock or to make maize alcohol (or ‘corn wine’) to sell at local markets, preferring the taste of traditional local maize varieties. Is hybrid maize contributing to food security or insecurity? I hope to uncover the answer during my data analysis in the months ahead. After four weeks of interviews in villages, rice paddies and corn fields, and numerous corn wine sampling opportunities, Mika and I finally check out of our hotel in the small rural town that has been our fieldwork base and board a 6 a.m. local bus for the bumpy two-day ride to Lào Cai city. We say our goodbyes in the nearby town of Sa Pa, and I’m off on an overnight train back down to Hanoi. As the train lumbers along, I close my eyes and imagine the faces of Hmong villagers I’ve met and the vast spaces of maize plants growing among rocks. I am still amazed and humbled by the stories I witnessed, and cling happily to the digital snapshots I have to rediscover when I return home. Sarah Delisle: At the end of May, after an eight-hour overnight train trip from Hanoi, I’m in a packed van travelling up the zigzagging road from Lào Cai city to Sa Pa town. Minutes out of the city I start to see the rice paddies built like staircases up mountain slopes. As we climb into the fog, I spot water buffalo walking along the road, and then several Hmong women carrying hoes. These now familiar sights make me excited to be back. This summer I was lucky enough to return to the Sa Pa area and follow-up with a number of my Master’s research participants from 2012. My research focuses on identifying and analyzing the impacts of livelihood stresses on ethnic minority Hmong and Yao food security in Sa Pa District, Lào Cai province. This summer my focus was on the long-term impacts of the 2012 drought that had delayed rice transplanting by four to six weeks in some villages. As semi-subsistence farmers, Hmong and Yao food systems rely heavily on natural assets, in the form of favourable weather conditions and arable land, for their food production. Access to sufficient land is an emerging issue due to population growth within Hmong and Yao communities, as well as in-migration, government policies restricting forest conversion and land lost due to landslides. In addition to intense rainfall-triggered landslides, other extreme weather, such as drought, cold spells and wind gusts, also restrict household productivity. This summer, after the required bumpy motorbike rides and challenging hikes up rocky trails with my wonderful Hmong and Yao research assistants, I spent several afternoons catching up with ten of my research participants. As a result of the 2012 drought, some householders indicated that they experienced a direct food security impact, the loss of rice and corn, while others discussed indirect impacts, such as the loss of cardamom, cultivated under the forest canopy and a vital source of income for many. The central importance of cash income for Hmong and Yao food systems stems from the dependence on hybrid rice seeds, chemical fertilizers and pesticides; much like what Victoria found for hybrid maize in Hà Giang province to the east. These seeds provide higher yields versus traditional seeds, but they also require Hmong and Yao householders to pursue more intensive income-generation to ensure reliable cash flow. As a growing domestic and international tourist destination, Sa Pa provides tourism-related income opportunities, such as guiding treks to local villages or selling traditional (and not so traditional) handicrafts. Unfortunately, householders also told me the tourism economy is subject to ebbs and flows that make this income highly variable. Due to a lack of robust opportunities, the majority of Hmong and Yao householders do not have reliable income streams. Sarah Delisle (foreground) taking a breather after a trek to Ta Phin village, Sa Pa district. / Photo courtesy of Sarah Delisle. While Hmong and Yao food systems have multiple vulnerabilities, the most encouraging thing I realize from this research is that many households are resilient in the face of these stresses. Sometimes householders worry about feeding their families, but many have a range of short- and long-term strategies for reducing their vulnerability and recovering from losses. For example, if a family has a rice shortage, they can either borrow rice through kinship and social networks or, if money is available, buy rice. Many householders are also receptive to new opportunities, such as renting out chronically dry land for cash-cropping, or adopting new technologies, such as buying mechanical ploughs to replace buffalo lost during cold spells. While I cannot predict how my research participants will fare in coming years, I think their current responses suggest a great deal of adaptability. Sarah Turner: “See the big key on the left of the keyboard with the arrow? Hold it down, now hit the ‘h’ key at the same time. Oops, try again, the two keys together.” Capitalizing letters is not quite what I was expecting to be explaining on a foggy Friday night. In the small upland town of Sa Pa, in northern Vietnam (where Sarah Delisle was based for her fieldwork), I’m in a packed, smoky internet café room with three Hmong friends, as they try to figure out why their Yahoo accounts don’t work anymore. Their struggles to get back online highlight how Yahoo’s new ‘security measures’ are pretty near impossible for semi-literate users to interpret. A capital letter is a useless item for these young women, who have taught themselves spoken English and basic writing skills over the years from being tourist guides in the area, much like Mika, Victoria’s interpreter. After we struggle with Yahoo’s endless irrelevant security questions ‘what colour was your first car’ (no Hmong or Yao household in the uplands has the money to own a car), I leave my friends at the keyboard and jump on a motorbike taxi up the road to a small social enterprise, Sapa O’Chau. Here I’m trying to help the director Shu, a young Hmong woman, and her enthusiastic, mostly overseas volunteer team (which has included both Victoria and Sarah Delisle). Tonight we’re putting together a funding proposal for money to furnish and paint their newly rented student hostel for ethnic minority youth to be able to attend the local school. I struggle to explain the managerial language of the funding proposal form from South Korea to Shu. In comparison, completing a SSHRC (Canadian Social Science and Humanities Research Council) grant application is actually fairly straightforward when I consider I get to write in my first language, with a continuous electricity source. I don’t lose my drafts in a blackout, as Shu does that Friday night, tearing at her hair in frustration. This all has little to do with my research regarding ethnic minority livelihoods, food security, extreme weather events and marketplace trade in the Sino-Vietnamese borderlands. With a dedicated group of graduate students and colleagues from McGill and Université Laval, I’ve been working in these uplands for 15 years. 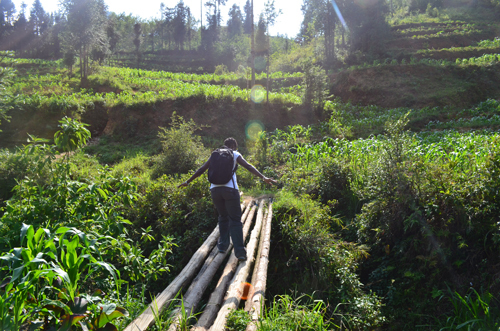 Victoria Kyeyune is a Master of Arts student in Geography at McGill, studying human geography and exploring the livelihood impacts of agricultural technology among upland ethnic minorities in rural northern Vietnam. She has a Bachelor of Science degree in Biology from the University of Ottawa, and a Certificate in Food Security from Ryerson University. Her experience includes research program support at the International Development Research Centre (IDRC), human health risk assessments and regulatory safety evaluations at Health Canada for agricultural pesticides, natural health products and foods. Sarah Delisle is a Master of Arts student in Geography at McGill. After finishing a Bachelor of Arts in Applied Disaster & Emergency Studies (ADES) at Brandon University (Manitoba), she was attracted to McGill by the opportunity to examine extreme weather events, livelihood vulnerabilities and household resilience in northern Vietnam. Her experience includes emergency planning and response with the Office of Disaster Management at Manitoba Health, disaster management work with the Canadian Red Cross, and research on rural vulnerabilities to climate variability with the Rural Development Institute at Brandon University. Sarah Turner is an Associate Professor in the Department of Geography, McGill University. Her fieldwork takes place with ethnic minorities in upland northern Vietnam and southwest China, and with street vendors in Vietnam’s capital, Hanoi. She recently edited the book: Red Stamps and Gold Stars: Fieldwork Dilemmas in Upland Socialist Asia (2013, UBC Press). Graduate students working with Sarah are members of the Minorities in the Southeast Asian Massif Research Lab. 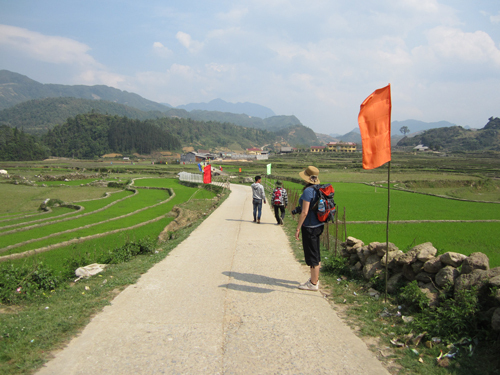 More information on Sapa O’Chau is available here. Wow, very memorable experience which reminds me of my fieldwork in Miao and Dong villages. I ‘d say that such fieldwork needs enough time to further understand their real lifestyle, and that it what I am thinking the weakness about my fieldwork. Very informative and helpful. good luck for your fieldwork, Victoria and Sarah.